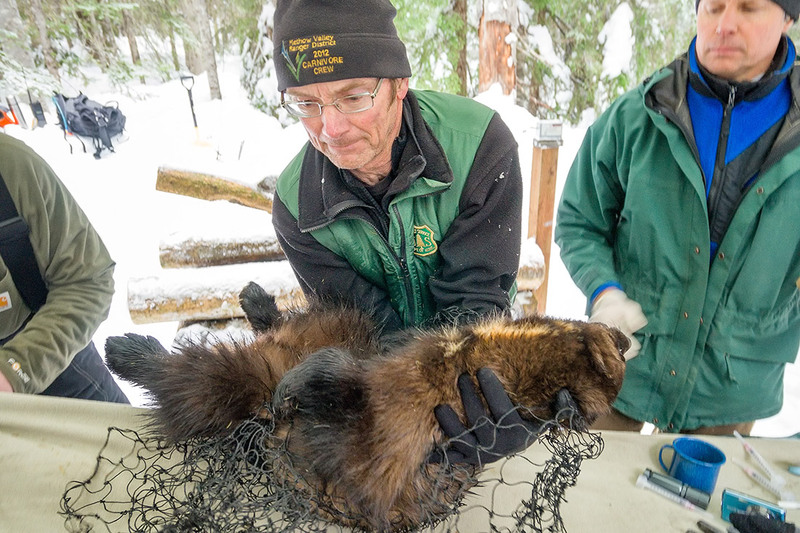 John Rohrer and Scott Fitkin examine a wolverine captured on Super Bowl Sunday, 2015. Credit: Zachary Winters, U.S. Forest Service. ON THE EVE OF THE 2015 SUPER BOWL, five words, like five toes, made an indelible track in the landscape of my mind. Easy Pass trap just triggered. Let the wolverine games begin. I received the text from U.S. Forest Service biologist John Rohrer, who had been live-trapping wolverines in Washington’s northern Cascade Range every winter since 2006. Over the past decade, he and Scott Fitkin — a wildlife biologist with the Washington Department of Fish and Wildlife — had captured 14 individuals in the rugged Okanogan-Wenatchee National Forest. They equipped each wolverine with a satellite telemetry collar, allowing modern technology to record the movements of these athletic carnivores through some of the wildest terrain in the Lower 48. Scientifically, the North Cascades Wolverine Study put wolverines back on the map of the Pacific region, with fur trappers having erased them by the early 1900s. Now the collaring project was coming to an end. And so were my chances of meeting a wolverine face-to-face. Map depicts sample activity areas for collared wolverines in the North Cascades. Credit: Cathy Raley, U.S. Forest Service. My husband, Robert Long, and I had ventured east over the mountains from Seattle in hopes of actually seeing one of the wolverines we study with noninvasive (non-capture-based) techniques. We knew the odds weren’t in our favor; we’d be in Eastern Washington for only a few days, and Rohrer and Fitkin had yet to work up a wolverine this season. Fortunately for us, their luck was about to change. Just before dawn on Super Bowl Sunday, we rendezvoused at Fitkin’s home in the Methow Valley, where a layer of fresh powder muffled the surrounding forest. I could hear my teeth chattering in the morning quiet, probably more because of nervousness than the penetrating cold. During snow-free months, the jaw-droppingly scenic drive between the valley and the Easy Pass trailhead takes about an hour. But from late November into May, much of this stretch of the North Cascades Highway is closed to auto- mobiles due to dangerous avalanches. In other words, welcome to wolverine country. Special K prepares to exit the Easy Pass trap. Credit: Zachary Winters, U.S. Forest Service. Seated on the rear of Rohrer’s snowmobile, I winced at the sight of the first avalanche slide looming just ahead. We dismounted our machines to assess the situation: the slope was a steeply angled sea of giant, glacier-blue snowballs, creating a surface so slippery I had to walk on all fours. Fitkin, however, was characteristically undaunted. Riding solo, he revved his engine hard and started to climb up, up, up the slide until — uh oh — he was coming back down, in reverse. “Didn’t expect so much ice,” Fitkin said with a calm grin as he arrived by our side. We shoveled out a route for our sleds and were on our way again. As we were crowning the second slide, a snow-mobile appeared from the opposite direction. The driver, part of Rohrer’s crew, had been sent out earlier to see who or what had triggered the trap. “It’s a wolverine,” he yelled over the roar of our motors. Robert edged his sled in next to ours and gave me a high five. Another half hour and we were trudging through the Easy Pass parking lot toward the nearby trap. Sounds like a lion, I thought to myself as we approached the wooden box — the wolverine’s low rumble resonating through the ground. The box was sturdy enough for a lion, too, constructed from logs much thicker than my thigh. 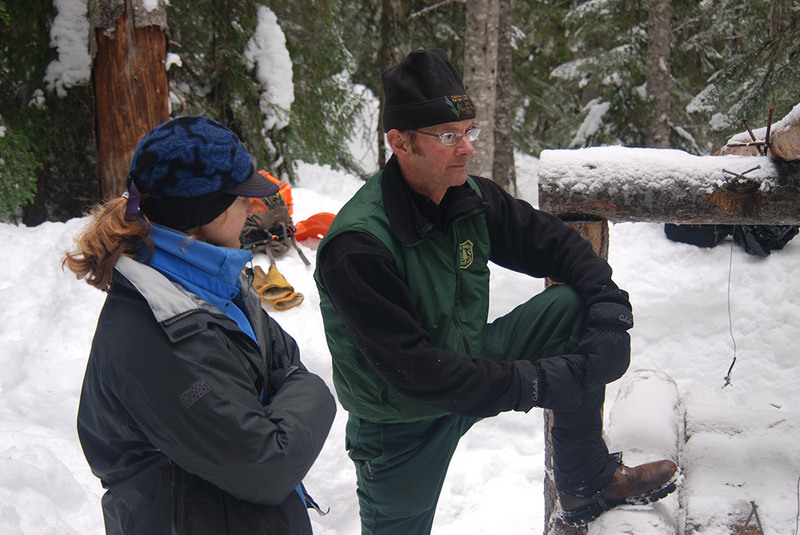 Cathy Raley and John Rohrer converse at the Easy Pass trap site. Credit: Robert Long, Woodland Park Zoo. 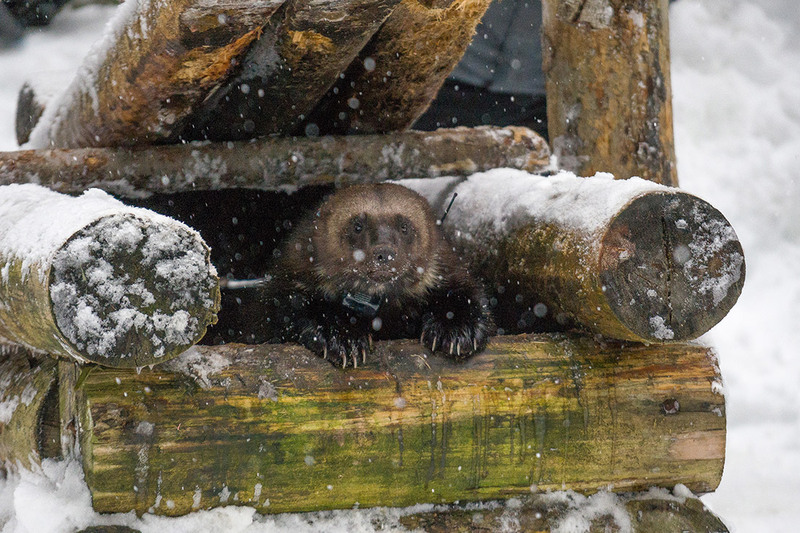 Rohrer and Fitkin hoisted the trap’s door just enough to allow Forest Service wildlife biologist Cathy Raley to peek in with a flashlight, which already bore toothmarks from a feisty wolverine. Raley said the marks were made by Logan, a subadult male captured three times during winter 2013–14. 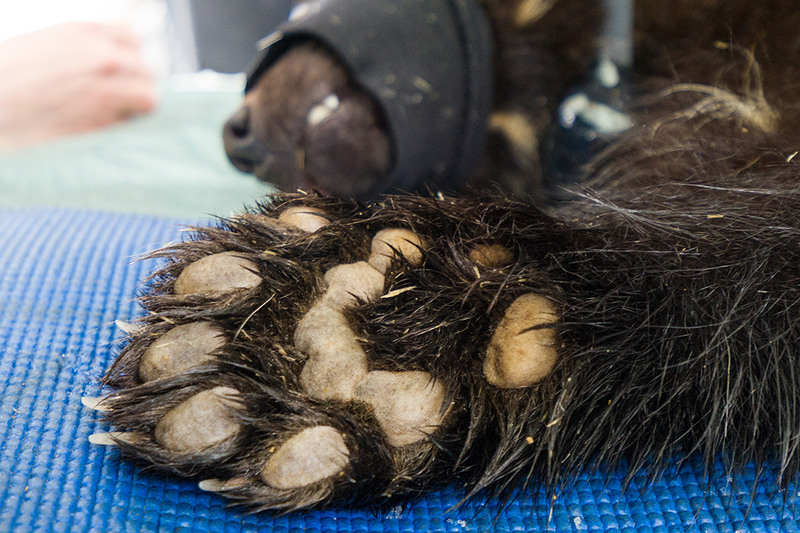 At the first capture, in December, the team noted several puncture wounds to Logan’s head and body, apparently inflicted by another wolverine. By March, his wounds had healed completely. “No collar, and this isn’t Logan,” Raley pronounced, two fiery orbs peering back at her from inside the box. Raley could identify previously captured wolverines based on their distinctive chest and throat patterns; she’d perused thousands of photos since initiating the collaring project with research wildlife biologist Keith Aubry in 2005. Aubry, now an emeritus scientist at the Forest Service’s Pacific Northwest Research Station, had observed a slow but steady increase in reliable wolverine reports from the North Cascades beginning in the mid-1990s — piquing his interest as an expert in rare carnivores. Gazing through the trap’s doorway, I could make out the weaselly form of a wolverine — smaller than I’d pictured given the animal’s larger-than-life reputation. Though wolverines are the second largest member of the mustelid family (surpassed only by sea otters), they typically weigh less than 40 pounds. This individual, another male, looked to be no bigger than your average border collie. But wolverines are notoriously tough for their modest stature and are known to defend their food from more sizeable predators, including gray wolves and grizzlies. Fittingly, Rohrer and Fitkin planned to call our visitor “Lynch” if he was new to the study, in honor of Seattle Seahawks legend Marshawn Lynch. 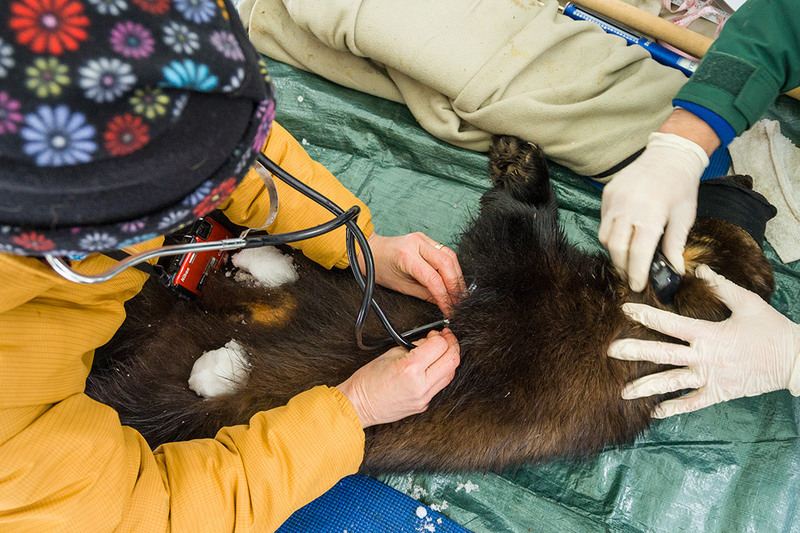 The author monitors the heartbeat of the sedated wolverine. Credit: Zachary Winters, U.S. Forest Service. Next, we went into full MASH mode. The experienced crew carved a makeshift operating table out of snow and erected a tarp overhead for cover. Then, the always- respectful Rohrer gave us a pep talk about safety and inclusiveness before running through his checklist one final time. Medical supplies? Check. Tracking collar and ear tags? Check. Data forms? Check. We were ready to roll. Rohrer sedated the wolverine with a jab stick, and gently lifted him to the snow-table about 10 minutes later. From this moment forward, I felt like I was the one deeply immersed in a dream. Sprawled out before me was the most iconic wanderer of the wild north. The wolverine’s huge feet, designed to carry him across frozen landscapes in search of food and mates, were equipped with crampon-like claws — essential tools for scavenging carcasses in hard-packed snow. His long, burly body, which measured nearly 45 inches from nose to bushy tail, was insulated with dense, dark brown fur, complemented by lighter lateral stripes along each of his sides. Combined with his broad head and short, rounded ears, the animal’s stocky frame evoked that of a small bear, for which wolverines are often mistaken when seen from a distance. But most striking of all was the wolverine’s smell — a powerful muskiness that permeated the air and settled into my nasal passages. Even when I went to bed that night, my fingers still held the scent. For the next 45 minutes, my assignment was to check the vital signs of the sedated wolverine while others assessed his health and tailored his tracking gear. In addition to monitoring his heartbeat, I would have to keep a close eye on his body temperature. “And how do I do that?” I asked the research assistant who was giving me instructions. “We have plenty of Vaseline,” he replied. long-distance travel on snow and ice. Credit: Zachary Winters, U.S. Forest Service. I watched Rohrer examine the wolverine’s formidable teeth and jaw, capable of cracking the femur of an elk as though it were a pretzel stick. “Broken incisor and a well-worn canine — not a young animal,” he said. Also, not an animal you’d want to upset with a rectal thermometer. I glanced at my clock: time for my first reading. After placing the stethoscope’s eartips into my ears, I positioned its chest piece along the fold of the creature’s hairy armpit. There it was: the heartbeat of a wolverine, not all that different from my own. I counted 32 beats in 15 seconds — within normal bounds. But his temperature was slightly elevated at 102.4°F. “Pack some snowballs around his groin area,” somebody suggested. I scraped slush from the ground and whispered, “Sorry, buddy,” as I proceeded to cool down my patient. Before I knew it, Rohrer was carrying the wolverine back to the box, his neck newly adorned with a telemetry collar. Now, there was little for us to do but wait for him to sleep it off. For the next two hours we stood around in the snow, chatting about football and wolverines and the universe in between. 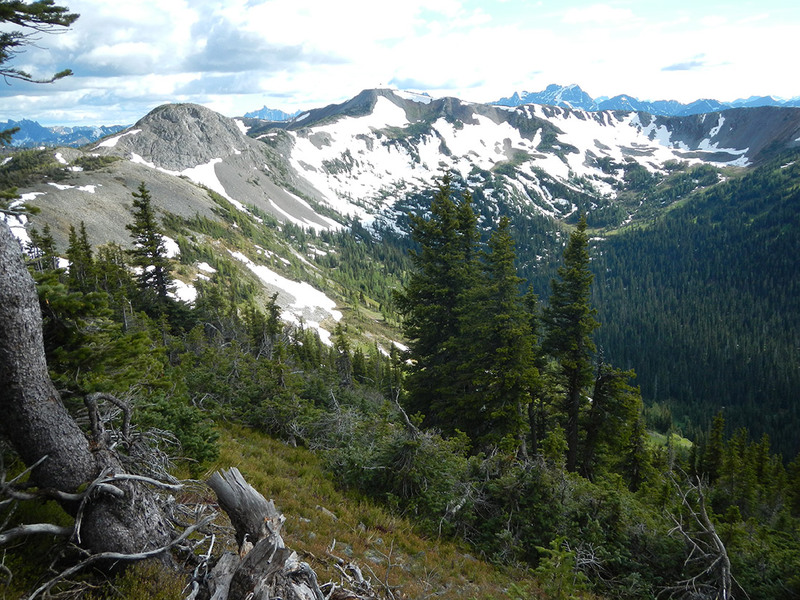 Wolverines require persistent spring snow for their reproductive dens in the North Cascades. Credit: Paula MacKay. “Go baby, go!” The relief on Rohrer’s face mirrored my own as the revived wolverine leapt from the open trap and ran into the forest. The process had gone like clockwork and our captive was free. Miraculously, we had even finished in time to make it back to Fitkin’s house for the second half of the Super Bowl. Turns out we had a much better day than the Seahawks, who infamously passed the ball rather than letting Marshawn Lynch run it with only one yard to go for the winning touchdown. The pass was intercepted by the Patriots. Lynch lost out on the wolverine-naming front, also. Our photos confirmed that the animal we’d trapped had already been dubbed Special K when he was first (and last) captured by the project in February 2012. The team couldn’t collar him back then because he didn’t respond sufficiently to the sedative. Special K was photographed by a remote camera in the summer of 2012, and then disappeared until Super Bowl Sunday. Rohrer and Fitkin ended up trapping Special K five more times that winter, at three widely distributed sites. The tenacious wolverine was apparently no worse for the wear. His telemetry data revealed that his activity area from March–December 2015 was a remarkable 1,000 mi2—not quite breaking the (2010) record set by his presumed father, Rocky, at 1,155 mi2. That’s about the size of Yosemite National Park. Genetic tests of hair and tissue samples collected from Special K and other wolverines who have recolonized Washington suggest that these animals came from British Columbia. Their return is good news from a conservation perspective, as the Cascade Range once again hosts all of its native carnivores — save the grizzly bear, which is the focus of an active recovery plan. 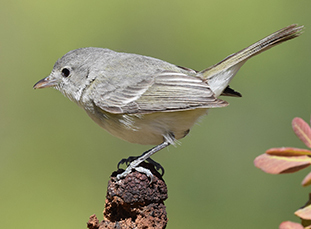 To date, three successful reproductive dens have been documented in the state — two in the North Cascades and one further south in the William O. Douglas Wilderness near Mount Rainier. Indeed, wolverines are definitely on the move, with multiple animals confirmed west of the crest and at least three adults now occupying Washington’s southern Cascades region. To get there from the north, they had to cross Interstate 90 near Snoqualmie Pass, a 15-mile section of which is being retrofitted with wildlife crossing structures. Tragically, this critical mitigation comes too late for a 37-pound male wolverine who was killed by a vehicle on I-90 in June 2018. Despite the wolverine population’s ongoing expansion, our research community remains cautious about the future, which holds no guarantees for a wide-ranging, snow-dependent carnivore. 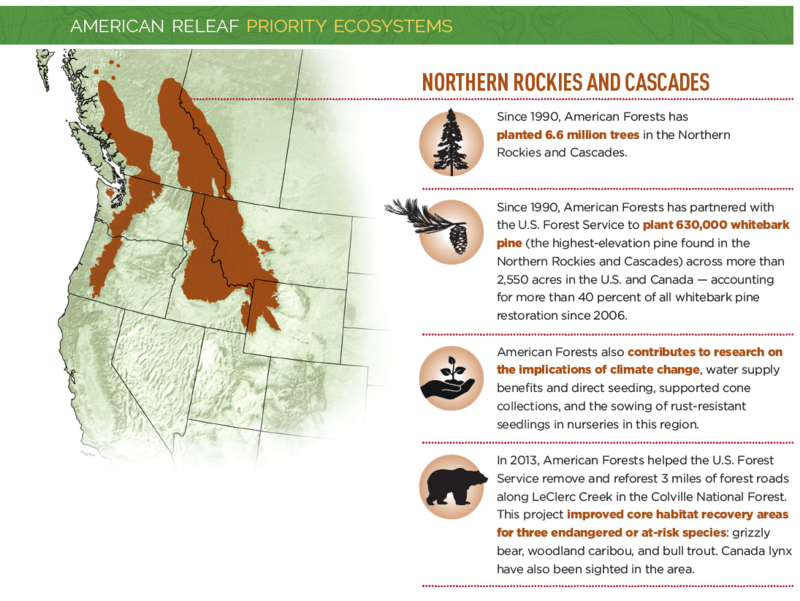 Raley worries that the narrow north-south band of wolverine habitat in the Cascades is vulnerable to development and disturbance given Washington’s rapid growth and the increasing number of people keen to live or play in the mountains. Some people wonder why climate change is a concern for wolverines in Washington if their population — presently estimated at 25–50 animals — is growing. Aubry points out that the current recolonization event and global climate change are operating in two very different time frames and warns that climate change will impinge on wolverines before the end of the century if existing trends continue. “One of the ways they could wink out is if they become isolated from their source population, and then you have inbreeding depression and other potential population problems,” Aubry says. Meanwhile, with the 10-year collaring study now complete, we are exploring ways to monitor Washington’s wolverines over the long-term. 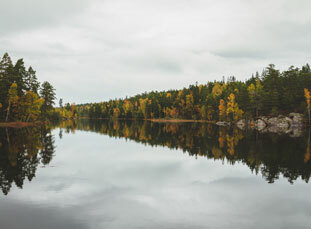 Remote cameras, coupled with hair-snagging devices, provide a cost-effective means to survey animals across vast areas like the Cascade — though wolverines are much more likely to frequent baited stations in winter, when it’s difficult or impossible for researchers to access stations for rebaiting. To help address this problem, Robert got creative in his role as a senior conservation scientist with Seattle’s Woodland Park Zoo. He collaborated with wildlife biologist Joel Sauder (Idaho Fish and Game) and engineers at Microsoft Research to develop an automated scent dispenser that releases a programmed amount of liquid lure on a daily basis, eliminating the need for winter revisits. The scent dispensers promise to be a game-changer for our monitoring efforts in the Cascades and were recently used in a multi-state wolverine survey conducted across Montana, Idaho, Wyoming and Washington. And Special K? As far as we know, he continues to roam the North Cascades, having last been photographed in 2016. Maybe he even has kits out there somewhere — carrying his genes into the future and trying to fill the void created by humans in the not-too-distant past. Paula MacKay is a freelance writer, field biologist and communications consultant for conservation. For the past two decades, she has studied wild predators with her husband, Robert Long, with whom she co-edited “Noninvasive Survey Methods for Carnivores” (Island Press, 2008).